Helsinki Pool, or Helsinki Allas in Finnish, is a sea spa by the Market Square with three large swimming pools, saunas, a restaurant, a café and the Baltic Sea Center that introduces the Baltic Sea. The building permit for Pool has just been confirmed. 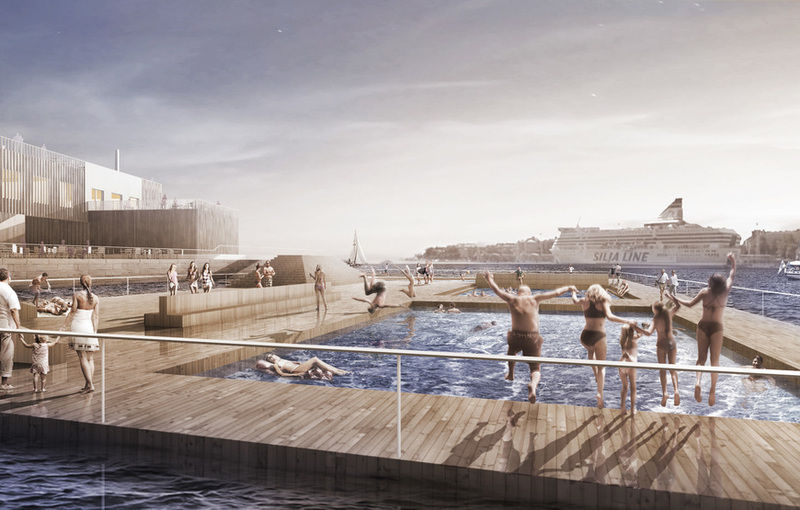 Helsinki Pool is a project where the city and the seaside are taken over for the citizens’ use. The Pool creates spa life within a formerly fenced concrete area, plants a park on a gravel landing and turns a parking lot into a sandy beach. With its land and sea areas, it is a piece of the city center almost one hectare in size. The Pool area can fit 3,500 people at a time, which allows as many as 10,000 visitors per day. 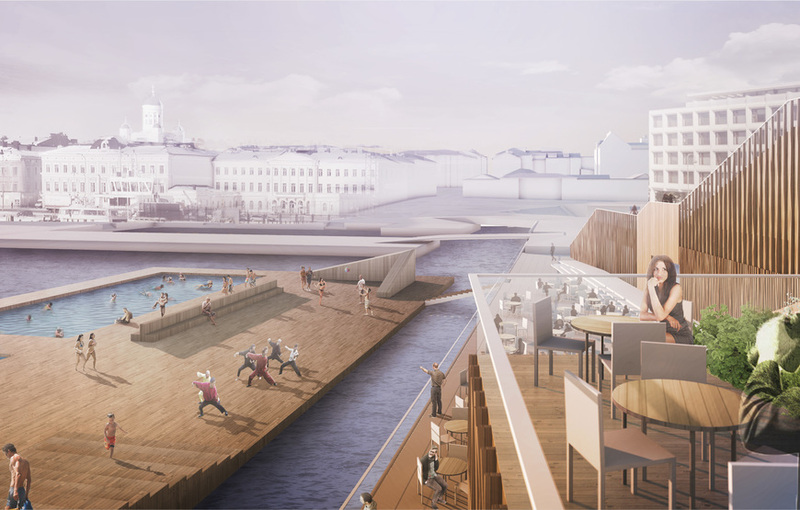 The story of the Helsinki Pool began in 2006, when the Korjaamo Group that runs Korjaamo Culture Factory in Töölö and the Ice Park at Rautatientori made a proposal to the city about founding a sea spa. The Sports Department liked the idea, but due to a lack of funding in the budget, the project was postponed year after year. Finally in the autumn of 2012, the Sports Department included the sea spa in its strategy, but nevertheless expressed a wish in early 2013 that the project be implemented as a private investment. 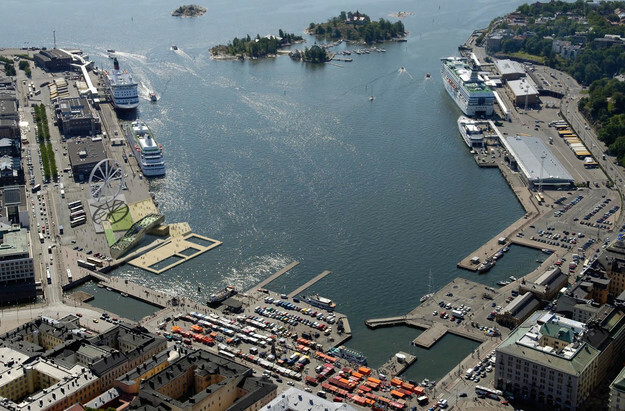 We founded a company, Helsinki Allas Oy (Helsinki Pool Ltd), and petitioned the city to allow us to use the seaside area by the Market Square. 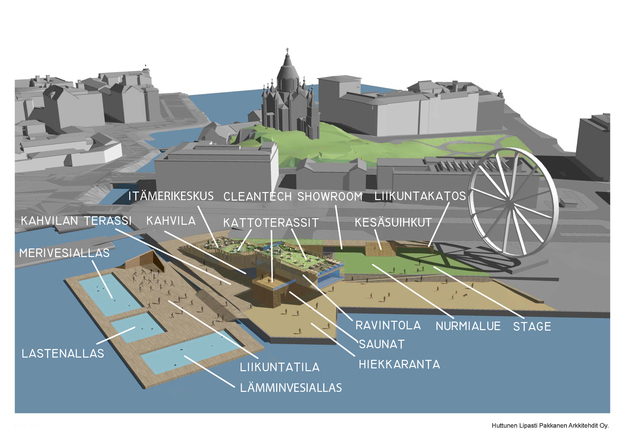 In June 2013, the Helsinki City Council reserved the lot by the Market Square for designing a city spa and its floating pools. Since June 2013, various permits for the Pool have been applied for. The City Construction Planning Commission (Kaupunkikuvaneuvottelukunta) accepted the architectural plan on September 4, 2013. The Uusimaa Centre for Economic Development, Transport and the Environment gave the project a special permit on November 27, 2014. On September 20, 2015, The Regional State Administrative Agency of Southern Finland gave the project a permit to use the water area for the spa. The Building Permission office gave the permit to begin construction on August 18, 2015. There were no complaints about the permit, and it is affirmed on September 28, 2015. The company has agreed with the Real Estate Department to sign an 8-year lease contract covering the years 2016-2023 in October 2015. The spa will be built out of Finnish fir, and its pools and saunas will be open around the year. 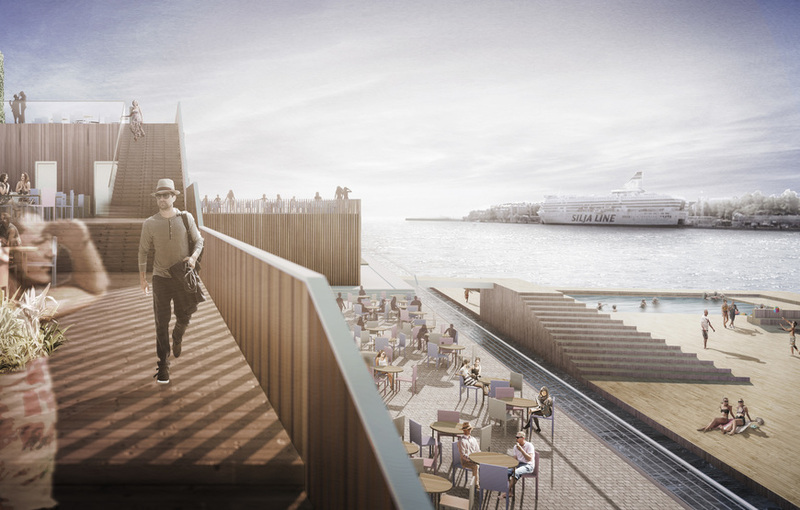 A giant floating lounging and exercise terrace with swimming pools will be towed to the side of the dock. The restaurant and café will renew Finnish restaurant culture and offer health food, sea food and the freshest raw ingredients of the season. There will also be events and activities at the Pool from music to movies and circus to theater. The Pool also offers opportunities for yoga, exercise, pilates or a swimming school. The Pool is a unique project the like of which cannot be found in Finland or elsewhere in the world. Helsinki Pool Ltd is a private company that collaborates with the city in a Public-Private-People pilot. 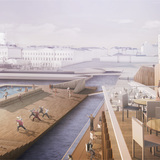 Helsinki Pool will revitalize Helsinki’s traditions as a spa city and bring the citizens of Helsinki an oasis of good life in the heart of the city. There were several spas operating in Helsinki in the 19th century, and there was also a popular spa on the shore of Kaivopuisto. Citizens and travelers visited the spa, where they could spend the whole day. A 1,200 m2 main building and a 600 m2 side building will be constructed for the Helsinki Pool. The ridge of the two-story main building will rise up to nine meters, and the building will be a calling card of Finnish architecture, where firwood is used to create homely and beautiful wood architecture. The buildings will form a pocket that will protect the naval spa from the wind and the noise of the city. There will be a garden-like terrace on the roof of each building. 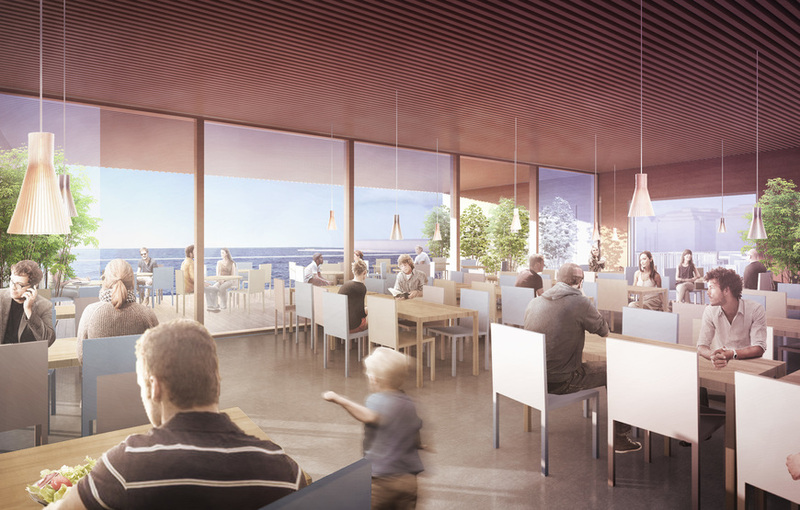 The restaurant, rooftop terraces and saunas will have a magnificent view of the open sea. From the café terrace, one can watch the Market Square and the ferries at the dock. 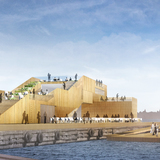 There will be three swimming pools, which will be embedded into one floating platform boarded with wood. 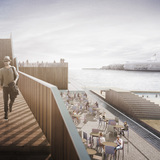 The heated 25-meter pool and the children’s pool will be freshwater pools insulated from the sea, where water circulates the same way as in lidos. The third pool will be a 25-meter naval pool into which filtered seawater will be pumped through an underwater pipeline. Since its founding, Helsinki Pool Ltd has been responsible for the permit process, planning, the regional work that started in 2014 and bringing municipal technology to the area. The company’s actual business will start in May 2016, when the construction projects are finished and the sea spa will open. The company’s target profit for its first year of operation is 3.9M €, with a long-term target of over 5.7M € per year. The main driving force will be the activities targeted at consumers - swimming, saunas, spending time in the area and restaurant services. These will form 84% of the revenue. The activity revenue will come from admission fees. 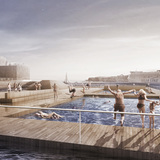 The company will charge an admission fee from customers coming to visit the area, to swim or to use the saunas. The admission fee will be 9€ for adults and 6€ for children. Prices of admission for events may vary. The daily capacity of the Pool is approximately 10,000 visitors, if the visitors change three times a day. After the starting years, our visitor target will be 290,000 persons per year, including about 210,000 visits in the summer between May and September and 70,000 in the winter. During the summer season, there would be about 1,700 visits per day. For comparison, we should mention that the Swimming Stadium gets about 2,000 visits per day on the average, with 5,000 – 10,000 visitors on a good day. Approximately 70% of the visitors will be adults. The target revenue for admission fees is 1.3M Euros during the first year, and will grow to 2.1M during the fourth year. Although there is no direct point of comparison, the number of visitors can be compared to other urban and lido venues: Särkänniemi (4 months) 1,500,000, Linnanmäki (4 months) 1,100,000, Mäkelänrinne swimming center 800,000, Suomenlinna 680,000, The Dolphinarium 665,000, Temppeliaukio church 560,000, Korkeasaari 520,000 (approximately 400,000 of which are summer visits), Casino Ray 330,000, Swimming Stadium (4 months) 300,000, Tapiola swimming hall 289,000, the Ateneum art museum 280,000, Sea Life 260,000, Central Espoo swimming hall 245,000, Moomin World (4 months) 220,000, Korjaamo Culture Factory 150,000, Kumpula lido (3 months) 130,000, Ice Park (3 months) 40,000. Café and restaurant business is another key area of business for Helsinki Pool. 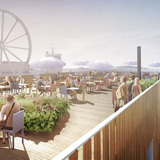 Café and restaurant customers will include both visitors to the urban spa and citizens visiting the southern side of downtown Helsinki, the Market Square, the city blocks and Katajanokka. There is free admission to both the café and the restaurant directly from the Market Square. The Pool world of restaurants is a significant opening in the Helsinki selection of restaurants. The location of the restaurant is excellent, and the designed new building with its terrace is notable Finnish wood architecture. The number of seats is significant: 1,600 seats in the summer, of which 1,200 are terrace seats. In the winter, there will be 500 seats, taking into account the winter terraces. Helsinki Pool plans to run the restaurant itself. The café is located in the ground floor of the main building near the main entrance, and its terrace opens towards the Market Square. The heated winter terrace will be under the main building. 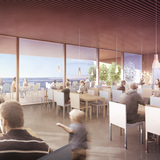 The café has seating for 200 customers indoors and on the winter terrace. During summer season, there will be 600 seats, including terrace seats. The café has a kitchen, and besides cafeteria products, it offers breakfast, light lunches, soups and salads and brunches. The café’s target revenue will be 0.7M Euros for the first year, and will grow to 1.4M Euros during the fourth year. The restaurant is located in the second floor of the main building. The restaurant has 300 seats for customers, of which 80 are on a glazed terrace at the end of the second floor of the building. There is a view of the open sea. The restaurant also has a bar with a view over the dock to the pools and the Market Square. In the summer, the restaurant also has terraces on the roof the building with a view of the open sea and the Market Square. 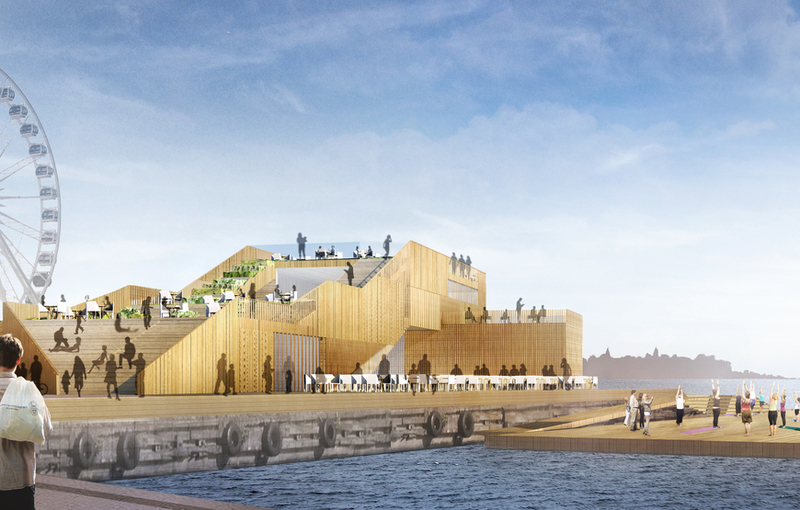 Also in the summer, the restaurant has an additional 800 or so terrace seats on the garden-like rooftop terraces of the main building and the sauna building. The restaurant has a kitchen and its own chef who is responsible for the Pool’s menus. The restaurant is for casual dining. It combines the latest health know-how with sea food and domestic raw ingredients. The restaurant’s target revenue will be 0.7M Euros for the starting year and will grow to 1.2M during the fourth year. The restaurant’s revenue includes catering for events. The company also offers services to corporations, space services for corporate events and long-term corporate partnerships to a limited number of companies. Helsinki Pool's partners include Hartwall, Kekkilä and Clear Channel. The share of corporate service of total revenue will be 14%, or approximately 800,000 Euros per year. There are also plans for city culture events for the area especially during the summer season. Planned events include concerts, pavilion dances and outdoor movies. Helsinki Pool also offers consumers organized exercise. Planned exercise services include swimming schools, aquatic exercise, gymnastics, yoga and pilates. Exercise services are provided in collaboration with operators in the exercise business. There will be a shop alongside ticket sales in the main building whose product selection is related to the operations of the urban spa, exercise and good life. There will also be Finnish design available for tourists. The operation of the shop may possibly be outsourced. More than regular lidos, Helsinki Pool seeks young adults to spend their time and also meet new friends. The Pool’s broad exercise and wellness services attract health-conscious adults who exercise regularly, most of whom are women. The target groups for exercise services are sport-specific. Families are the basic visitors of lidos, and Helsinki Pool invests in them through things like the children’s pool, playgrounds and nursery areas. Tourists are an important customer group. The Pool has an opportunity to become one of the best-known tourist sites in Helsinki. The passenger traffic of 2 million people at the neighboring Viking Line and the flow of over one million people from the cruise ships are important target groups for marketing. Restaurant customers include both people visiting the urban spa and citizens who like to spend time at restaurants. 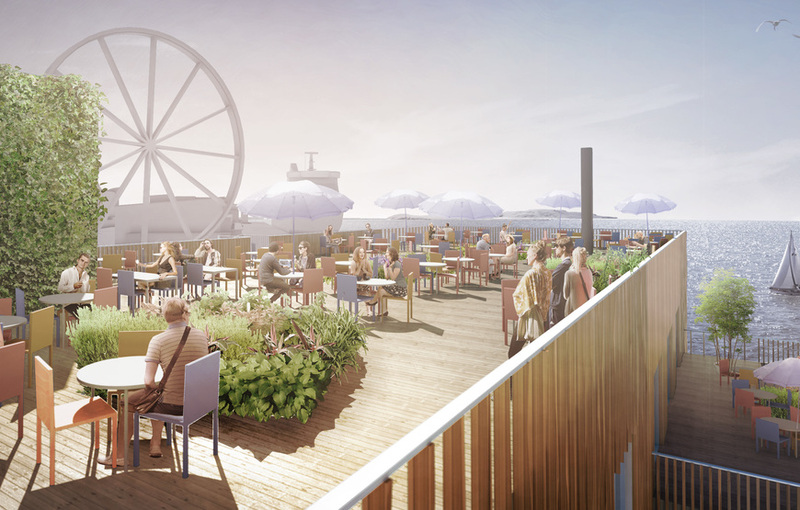 There are plans for a new nightlife meeting place for adults in the restaurants and rooftop terraces. The primary target group for music and other urban culture includes young adults and active consumers of culture. Helsinki Pool’s marketing philosophy has several cornerstones: publicity, partner media, digital marketing, target group and special media and on-site visibility. Helsinki Pool’s services will be affordably priced to make sure that they reach the general public. There will be price differentiation especially with cultural and corporate events. There are about a dozen experts from different fields responsible for the Helsinki Pool project who have planned future business, structures and projects. The team represents multi-disciplinary know-how including cultural business, restaurant business, business strategy, funding, architectural design, construction on both land and sea, construction project management and cleantech. The team has experience in producing large events and serving big audiences. Project manager responsible for the Allas concept, business plan and organizing operations. Grünstein is a forerunner of cultural business and the current CEO of the Korjaamo Culture Factory. He is the founder of the Korjaamo, the Image Publishing magazine publishing company and the Image Match sponsorship company, which has negotiated sponsorship agreements worth a total of 40M Euros. In 2014, Korjaamo had a total of approximately 250,000 customers. Marianne Mäkelä is responsible for planning operations and the market. Mäkelä is the COO and marketing director of the Korjaamo Culture Factory. Mäkelä has worked as the marketing director of the MTV3 television channel and as the director responsible for brands at Alma Media. She was the CEO of Viherjuuren Viestintätoimisto and Image Match Oy from to 2003 to 2008. Pekka Salmi is responsible for funding strategy and planning. Salmi has worked for Sitra in tasks related to corporate strategy, business development and venture capital for the last 18 years. He has been a board member in approximately 30 companies, including Fimet, Finnsonic, Helkama-Auto, Marioff, Meconet, KONE Instruments, Megatrex, Metso Powdermet, Neorem magnets, Okmetic, Panphonics, Solid Information technology, Space Systems Finland. Kim Heiniö is responsible for planning and organizing restaurant business. Heiniö is the founder and CEO of Toothpicks & Honey. He has worked as a restaurant manager and developer of restaurant business in the Helsinki metropolitan area for more than 20 years. Heiniö’s restaurant units include Pastor, Southpark, Block, the Dylan lunch and brunch restaurants and the Soupster catering service. Heiniö has made restaurant designs, including Kattila at Linnanmäki, and consulted shopping malls in the development of restaurant business. Active citizen, new Katajanokka resident and founder of design agency Måndag. Rantanen is responsible for the technical solutions of the floating structure. Rantanen is a founding partner of Marinetek Finland. He is one of the most experienced experts in floating structures in Finland. Urala is responsible for the architectural design of the floating pier area. Urala is the leading architect of Marinetek who has designed the floating pool block opened in Gibraltar, among other things. Meelis is CEO of Akso-Haus OÜ. An Estonian growth company, Akso-Haus is the Nordic leader in modular building. The company has built hundreds of villas, holiday homes and spas in Finland, Sweden, and other Nordic countries. Välikangas is a construction project manager and construction consultant. Välikangas is the project manager of Ramboll CM, the largest construction expert organization in Finland. He has been responsible for the project management of several spas, the Haltia Nature Center and the future Helsinki Central Library, among other things. Hulkkonen is responsible for the Pool’s cleantech solutions. Hulkkonen is a partner in Solved – The Cleantech Company, which has consulted dozens of companies and regional development projects with their cleantech solutions. Hulkkonen has been a cleantech expert at Finnpro and Sitra. Pekka Pakkanen is the project’s chief designer and is responsible for architecture. Pakkanen is a partner in the Huttunen-Lipasti-Pakkanen architectural agency, which has won an award for wood construction. He was also the Finnish main designer of the Gösta museum in Mänttä and has been the Finnish architect in team of the victorious proposal for the Guggenheim museum building.